The July/August 2018 issue looks at how an aging population is creating demand for a new set of products and services. From health care services to in-home assistance and technology designed to cater to the needs of the elderly, business models are changing in response to an emerging group of older users and customers. Below is a preview of the content in the July/August edition of MMG. 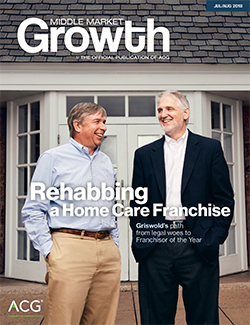 Fast-changing employment regulations and management missteps set Griswold Home Care in the legal crosshairs of its franchisees. It took a new CEO with a collaborative approach to rebuild trust and position the company to take advantage of demand for its services from the growing aging population. Middle-market private equity firms face a particular set of challenges when planning for their future leadership, from transitioning responsibilities within a lean staff, to sharing compensation and deal economics. PitchBook’s founder and CEO explores emerging technology offerings designed to serve an aging population, ranging from mobile applications to biotech. Maureen Hewitt writes about her company’s role providing custom health care and social engagement to help seniors age in place, primarily through the Program of All-Inclusive Care for the Elderly. Minnesota-based Foreverence has reinvented the production process for cremation urns, using 3D printing technology to create personalized designs, including a replica of Paisley Park developed with Prince’s family. 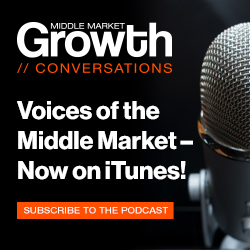 The Middle Market Growth Conversations biweekly podcast series is now on iTunes! Listen to interviews with middle-market influencers on the go. The print issue is sent as an exclusive member benefit; if you’re not an ACG member or prefer a digital copy, you can find past issues in MMG‘s online archive. In 2018, MMG expanded to six issues from four. Grow with us: Learn how MMG can help tell your story. As always, the MMG editorial staff welcomes any feedback, including story ideas. Email us at editor@acg.org.